... average human being believes that he or she is cause to something, and therefore everything starts with the ego center projecting itself outwards into the screen of life. As long as we live in that space of the ego center, there can be the apparency of change but no real change can come about. It (is) not a matter of the expansion of consciousness. In order to break through consciousness, you must come upon your true identity. This means leaving behind all concepts, all ideas, all thoughts of what you might be. You must die to what you think you are and be born into what you really are; that is the true heritage of the soul. (...) another way of viewing life, be allowing oneself to be viewed. He described a spiral moving toward a central point. "What you are is the composite manifestation of a moment of time. 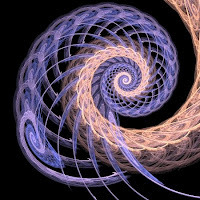 This spiral is continuously working its way toward the center, re-forming you each moment. But because you think that you are the cause of something, the movement of the spiral is blocked. God needs man, but He can only bring man to Himself when man truly knows that he needs God." - from The Last Barrier: A Journey into the Essence of Sufi Teachings by Reshad Field.